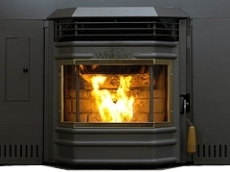 The Whitfield Profile insert is based on the freestanding Whitfield 30 pellet stove. The hopper size is reduced to 50lbs, with a slight reduction in heat output. Because of the reduced hopper size, the burn time is reduced to a maximum of 30 hours. This insert can be attached to a wall thermostat, and will shut down and re-ignite as needed to keep your required temperature. As a safety feature, it has a 'photo eye' which can see if flame is present in the stove or not. Max. Heat Output 37,000 btu. Window Size 21" by 9"
The large bay window layout of the Whitfield Profile insert gives a good view of the fire from anywhere in the room. A log set is available as an option to make the stove look more like a traditional woodburner. The three ash pan arrangement is a little clumsy. The 'ultra grate' should be checked every day or so, making sure that the air holes are scraped clean. Initially you need to check ash levels every day or so until you get used to how much ash is produced by the pellets you're burning. The Whitfield Profile insert has three ash pans: the centre one which will be the most used slides straight out. On either side of this there are pans which must be lifted clear before emptying. It's advised to check the exhaust passages and vent pipe for a build up of fly ash every month or two. Remove the ash clean out ports and either brush out or use an ash vacuum. Between one and six months, clean the photo eye and the filter it detects the flame through. The heat exchanger tubes have a built in scraper to remove fly ash. Recommended frequency is from two days to two weeks. Door gaskets, window wash vents and the rear stove compartment are advised to be checked once a year. If you would like to leave a review of the Whitfield Profile insert, please use the form on the contact page.